Hello! I work in Poser with animation. 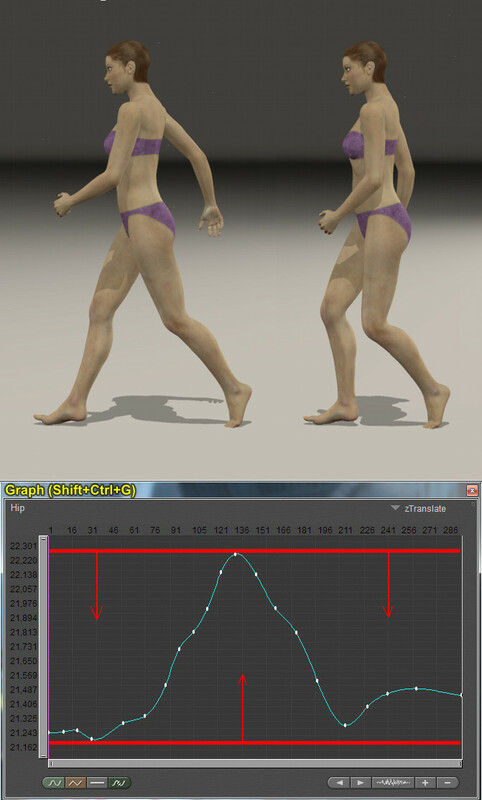 The most important tool for customizing animation is the Graph of motions (Shift+Ctrl+G). The Graph of motions allows you to configure any movement very precisely. But the Graph of motions not has some additional features to automate the process. I need to change the range of the graph in all key frames at the same time. I can select the entire graph and move all keyframes simultaneously on one and the same meaning, but I can not change amplitude of the graph, for example, to change the amplitude of human steps for all key frames. I raised this issue at the RuntimeDNA forum ([http://forum.runtimedna.com/showthread.php?87137-Poser-Pro-2016-wishlist/page39](link url) mesage #777), but maybe the developers have understood me not correctly. They added a reset button for motion graphics. That's good, but it did not solve the problem. I'm unclear as to what you want to do, but if my guess is correct, then this will help: open the graph, select a range of keys (it can be all the keys if you like). The cursor will be two horizontal double-ended arrows. Then within that dark grey selected area Ctrl+leftclick and hold. The cursor should change to two vertical double-ended arrows. Drag the keys up to increase values, or drag them down to decrease values. Interesting topic. I need to learn more about this as well. Are there also video tutorials we can refer ?? I need to change the amplitude of the graph. Perhaps you do not understand the word "amplitude". I need to change the maximum and minimum value of the graph at the same time. There is no simple method to see change the Max and Min of the graph as in select a range and say to adjust the Max to 1 and the Min to .5 and have all the points be adjusted the correct amount based on where they are in value. However attached is a way to accomplish what you want. It involves using layers in the graph palette. Above is a movement similar to what you show. I put in keys on each frame to make it appear like a BVH or otherwise hard to adjust movement. Above here is my adjustment in RED and what will play out In BLACK. At this point I have the adjustment layer turned off so it has no effect on the output. Here is the result when I add my adjustment layer into the mix. The movement went from 2-0 to 1-.5. And here is the original movement layer with all the keys selected as the layer to edit. The current lines you can edit are in RED.. The result is in BLACK. I try to avoid put anything on the base layer as it makes it harder to play with (since you can not disable the base layer in play back). Hope this helps get you the results you are looking for. One final image this is a BVH file and a simple 3 point spline to move all the Keyed points (with in the range) without making a ton of adjustments. Because someone on another forum complained about not being able to slowly move a movement away from another body part, because the suggestion in post #2 above will move all key frames the same amount. This will slowly start to move reach Max and slowly return to the original Key Framed Movement. @richard60 I'm having difficulty with translation into Russian language. I do not understend where you take the second graph? The last two pictures are showing a BVH movement (in Black) and the addition of my adjustment in Red. For this adjustment I made a new layer Starting at Frame 160 and Ending at Frame 185. Key Framed both ends 160 &185 and just added in 1 additional Key Frame and pulled it down which pulls all the rest of the BVH (Black line) out of position. This is to show that you can change the values of a lot of Key Frames by varying amounts so the movement is changed, but not in an abrupt manner. I know about the possibility of adding layers of animation in Poser, but I never used it. This process is similar to the work of the sweep of the oscilloscope. The second graph should be synchronized with the extreme values of the first graph. This is very interesting, and difficult method. I need some time to learn to do it quickly. I sent a message to Poser developers. Maybe they will be able to refine this tool in the next version of the program.